Try these One-Eyed Monster Cupcakes that are more fun than scary. 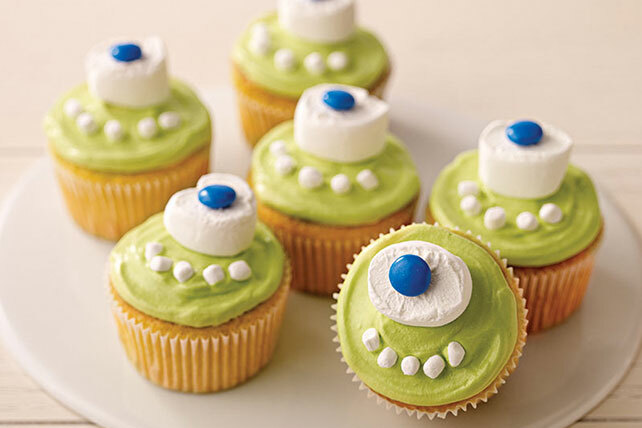 These One-Eyed Monster Cupcakes are also more fun than difficult to decorate! Swap out green food coloring for a color of your choice to help personalize these cuties. Add 1 Tbsp. dry gelatin mix and food colorings to frosting in medium bowl; stir gently with whisk until blended. Stir in COOL WHIP. Refrigerate until ready to use. Prepare cake batter and bake as directed on package for 24 cupcakes, blending remaining dry gelatin mix into batter before spooning into prepared cups. Cool completely. Spread cupcakes with COOL WHIP mixture. Decorate with remaining ingredients. Substitute 24 fresh blueberries for the candy-coated chocolate pieces. Use ice cream scoop to neatly and evenly fill the prepared muffin cups with batter.